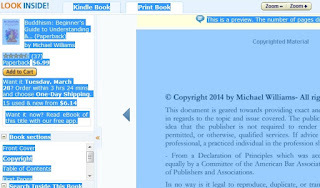 Are you sure you can copy text from "look inside" Amazon books? I know there are people trying to copy text in Amazon books Look Inside! pages, but it cannot be done, right? By default, you cannot copy the few preview pages of Look Inside! from Amazon books. Sorry, my original tutorial below CANNOT WORK anymore! I have already deleted it away. There are some books which have Kindle option can still be be copied! Remember, NOT for all titles. Let me share with you how you can still copy out the text or words from Amazon Look Inside! Now it is even simpler to copy the preview content of Amazon Inside. No need any special software. 1. 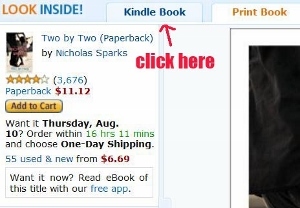 After you have searched the book which you want in Amazon, click on the Kindle Book tab. Note: Not ALL titles have Kindle Book option. And also NOT all books which have Kindle Book option can be copied. 2. Put your cursor outside the main page, right click on it and then click "Select All". 3. If it looks something like this as shown below, it means it can be copied. 4. Right click again and then click "Copy". 5. Paste the copied content onto the NotePad. 6. Now you can edit the text. You can either select out the content you want or delete away those unwanted text. Note: When you use your cursor and "Select All" and get the outcome as shown below , then it means this particular book CANNOT be copied! 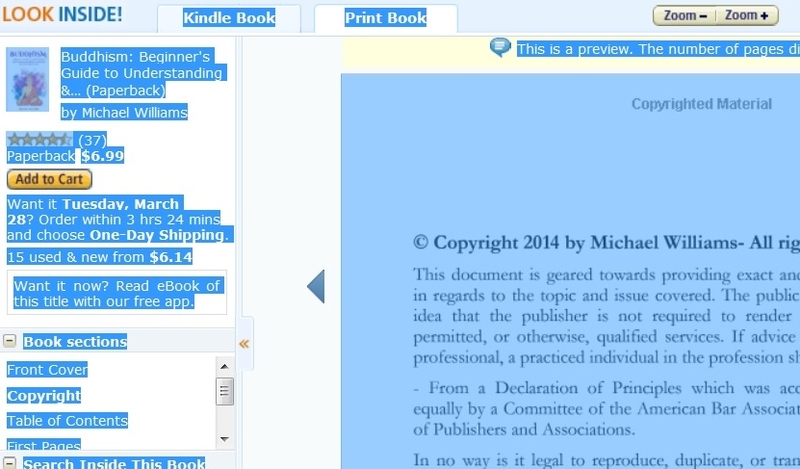 Note: *Here is a much better method to copy book preview pages from books. You get more free pages and from more books.